When inspiration meets preparation, it's almost a guarantee that you can achieve anything you set your mind to. That's true in life as well as in sports. Take for example the way Geje Eustaquio approached his fight against the solid as a rock Kazakh opponent Kairat Akhmetov. He doubled up on his training and preparation and at the same time, it's obvious that he wants to win in front of his ever supportive countrymen. In fact, during the post-fight interview, he relishes the feeling of winning for his motherland the Philippines . "This belt is not mine, but it's ours. I'm proud to represent this flag, this country, it's ours, guys!" said Eustaquio. His fight against Akhmetov was the main event of the show. People expect an explosive match as Eustaquio wants to avenge his split-decision defeat last September. It was as if the God of War Ares smiled when he saw the two fighters met on the cage as it was a high octane fight from the first up to the last round. This time around, Eustaquio fought with all his might to get the unanimous decision victory. 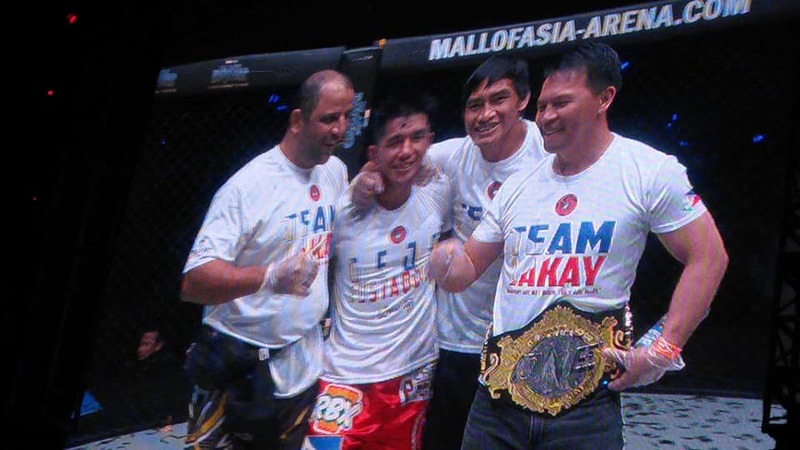 He now joins ONE heavyweight champion Brandon Vera as the only Filipinos to hold world MMA titles. By virtue of this big win, he is now projected to face ONE undisputed flyweight champion Adriano Moraes, who was spotted watching the match live at cage side.